Expert running tips. Oh yeah. I've been a runner for about 11 months now, and by "runner" I mean "person who owns sneakers and moves marginally faster than a walker in them." Anyhoo, since I'm such an experienced runner now, I thought I'd share a few tips on how to have a suuuuuuper great run. Just a little knowledge I picked up today on my run. Step 1. Eat very large bowl of fiber-rich lentil soup. With cheese. Step 2. Don't wait long enough before deciding to go to the gym. Step 3. Start running. Start cramping up. Keep running. Step 4. Walk it out. Run. Bathroom. Repeat steps 3 and 4 several times. Feel stupid for lentils. Step 5. Finally hit stride around mile three. Worry about snow outside. Step 5.1. Take selfie on treadmill. Step 6. Run, run, run. Stare at nail hole in opposite wall. Run, run, run. Step 7. Think about friends facing serious health challenges. Feel grateful for working legs. Step 8. Finish strong but don't look at time or pace. Doesn't matter. It's done. These photos are a little over a week old, but worthy of posting. It's my mother in a really funny hat! Check her out! For the last few years, my mom and I have been going into the kids' school for St. David's Day to talk a little bit about our Welsh heritage (mom's mother was a Welsh immigrant and her father was the son of Welsh immigrants) and to make a little Welsh treat, Welsh griddle cakes. 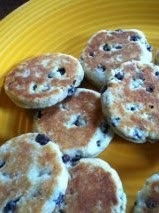 I blogged about St. David's Day a few years ago and posted the recipe for griddle cakes here. We have good time and the kids seem to like it. See? Don't they look riveted? Ha! No, they actually do seem to like the presentation. My mom puts on a good show, singing the Welsh national anthem for them (in Welsh) and wearing her fun getup, and they also get to help make and cut out the griddle cakes. That's pretty fun when you're seven. 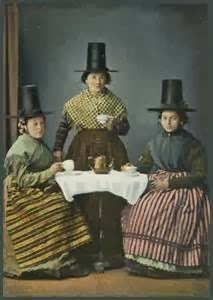 Happy Belated St. David's Day! Sorry about that whole "I missed the entirety of 2013" thing. Heh. I'll see what I can do later about posting some photos from that year. That entire year. Soooo. Anyway. Diving back in where we are, because that's the only way this thing is going to work. It's been a snowy, snowy winter. Lucky for us, we don't mind the snow so much (said the woman who does not operate a snowblower - ahem). There's skiing and tubing and hot chocolate and a warm house, so what's to complain about? And double lucky for us, we live a mere seven minutes away from Black Mountain of Maine, which is about the friendliest family ski mountain you could hope for. Unbelievably cheap downhill skiing ($15 lift tickets!) and world-class Nordic ski trails. And tubing! Scary/fun tubing, which was all free this past Thursday, so I packed some sandwiches for dinner and we headed up to the mountain. Annie and Betty playing in the tubes. They were really too little to go down the mountain. ﻿ ﻿ And, of course, the camera battery died, so this is all we have of that night (plus a few videos I can't figure out how to upload to the blog). But so fun! It seemed like half the town was there and we tubed until it was just tooooo cold and then one by one (Annie and I were first) we trickled into the lodge to eat our sandwiches and apples and carrots and the free lollipops that Franklin Savings Bank was passing out. Man, we love living so close to the mountain! Only a few hours in...still feeling good. The end of the day. Bonkers. Letting the kids take over. For all my complaining about it, I really do like the annual gingerbread house-making marathon (I said, after a reasonable night's sleep and with all the baking done). And I LOVE the putting together and decorating part with my family. That's the best and then it's all really worth it. Because I've had the recipe (which is not mine - can't take the credit, but I can say THANK YOU Beeckel family for sharing it with me years ago) and the how-to requested a few times, I thought I'd post Part One here now. I'll post more about the construction and decorating after we decorate them this Friday. First: the recipe. This makes somewhere around 10-11 small houses. Beat butter (margarine) and sugar until light. Add molasses and water; beat. Add flour/spice/soda/salt mixture, as much as needed to make a stiff dough. I refrigerate the dough for a few hours (or, you know, a week or two if I am organized enough to make it that far ahead of time), but sometimes it needs to soften a bit to roll it out. Roll about 1/8-1/4 inch thick (pretty thinnish on a well-floured surface. Cut into house pieces (look for patterns online or make your own simple one). Put on baking sheets lined with either silicone baking mats (like Silpat) or parchment paper, which can be found at the grocery store with the aluminum foil and plastic wrap. The Silpat/parchment paper is pretty important, or you will be awfully disappointed when your pieces stick and then break as you try to get them off. Bake at 350 until the pieces puff up a bit and then sort of flatten back out - maybe 15 minutes or so? They'll be soft when you first take them out of the oven, but let them cool for a few minutes on the baking sheet before you put them on a wire rack to finish cooling and hardening. To make your own simple pattern, experiment with paper and scissors until you get what you like, then cut out of stiff paper and LABEL your pieces. Sometimes the roof piece can look an awful lot like a side piece, and then things get all mixed up. Or so I've heard. Heh. You need two of each piece for one house. Lay your paper templates on the rolled out dough and cut with either a sharp knife or a pizza cutter. I pretty much always use a pizza cutter now. a really large amount of dough and cut a bunch at once. To transfer, a very thin spatula is useful. A very thin metal one is great. If you are going to cut out windows or doors or anything like that, do it AFTER you have transferred the pieces to the baking sheet, otherwise they're harder to move. I use mini-cookie cutters like hearts, circles and stars for the windows, but I've also just cut little windows out with a knife. They don't have to be perfect to be cute. Don't worry if your pieces get a little wonky and not perfectly straight after they've been transferred to the baking sheet. Do what you can to straighten them out before baking, but just remember that they'll still work for putting them together if you have a lot of royal icing, and also they'll be candy-encrusted, which will cover a multitude of sins. The dough scraps can be gathered and re-rolled over and over. Since they probably won't get eaten, it doesn't matter if the dough gets tough. Besides being useful for windows, I love mini-cookie cutters for things like candy canes and little tiny gingerbread men. Cute, cute. And, just because they're cute. How many wiggly kids can fit into an election booth? Do you think I could have squeezed in a few more? And we have the stickers to prove it! Then, off to the dentist. No cavities, yay! Much lighter wallet (no dental insurance), boo. Grandma wanted new photos of the kids for her Grandma Wall, so after church today, Curtis played photographer and got some good photos of the kiddos. Alex P. Keaton. Also, he just told me he wants Mitt Romney to win. Curtis told her to think about the color yellow. So, here she is, thinking hard. Where did the tie go???? It really was a lovely day. The kids were (more or less) well-behaved at church, the photos came out nicely, we had a lot of fun family time taking turns playing Angry Birds on the Xbox, I made a super-delish dinner (whole-wheat pancakes with strawberry-blueberry-raspberry sauce and real whipped cream, and bacon on the side), the kids played so nicely after dinner (they were bears getting ready for hibernation, which meant they had to eat lots more food - cold pancakes and raw green beans - ?) and bedtime went off without incident. They are all sleeping soundly now, Curtis sitting next to me playing Angry Birds as I type (he really likes this game...) and I'm heading off to bed in a moment.